Ben's brother-in-law Phil is quite a keen angler and he's done a bit of bassing with ben and myself in the last year or two. 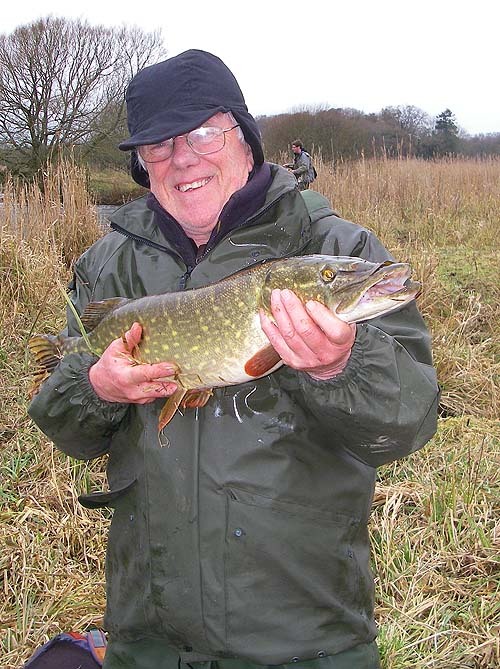 However, Phil had never seen, let alone caught, a pike. 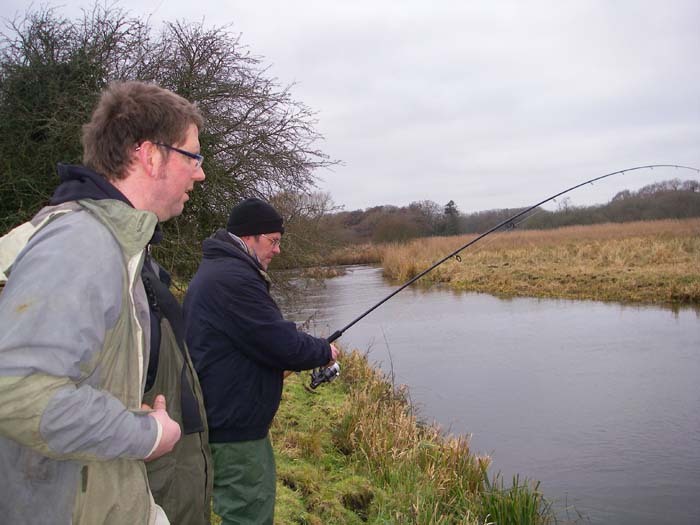 On new year's day we set out to try and rectify the problem with an afternoon on the local river. All three of us were armed with spinning rods, braided lines and circle hooks on knottable wire traces. My pals were both float fishing so that they could search the water and I had opted for a paternoster in order to keep the bait exactly where I put it. We started by trying to catch a few baits but with the low water conditions the dace were not in a cooperative mood and we struggled a bit. Eventually we managed to land a few but they were mostly on the small side. However, beggars can't be choosers so off we went to try our luck. On getting to the river we put Phil in what we thought was the prime spot and he lowered his bait into the water. I wandered a few metres upstream and dropped my paternoster into a gap in the overhanging brambles. Wallop! 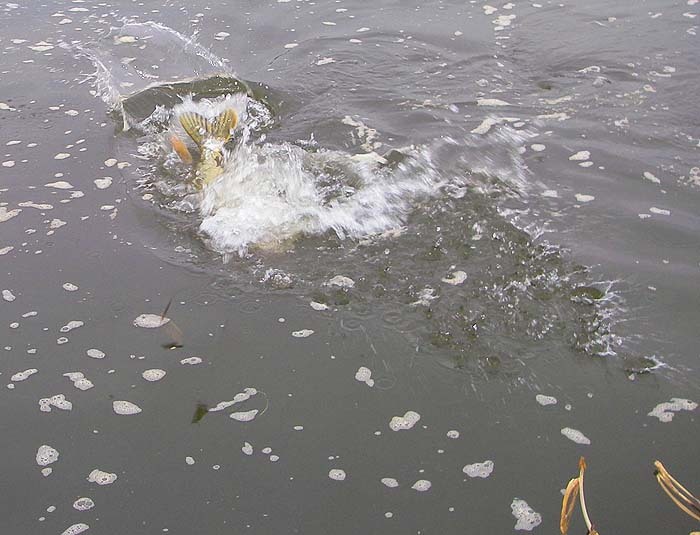 Within a couple of seconds the rod arched over as a pike took the bait. I tightened and called to the others that I had a fish on. Ben began to walk up towards me but before he arrived the fish had managed to release hook and bait. Bother!!!! (or words to that effect). I tried again in the same spot anticipating that the pike was probably still there and wondering what had happened to its meal. Perhaps one minute later the bait was taken again and this time there was no mistake. 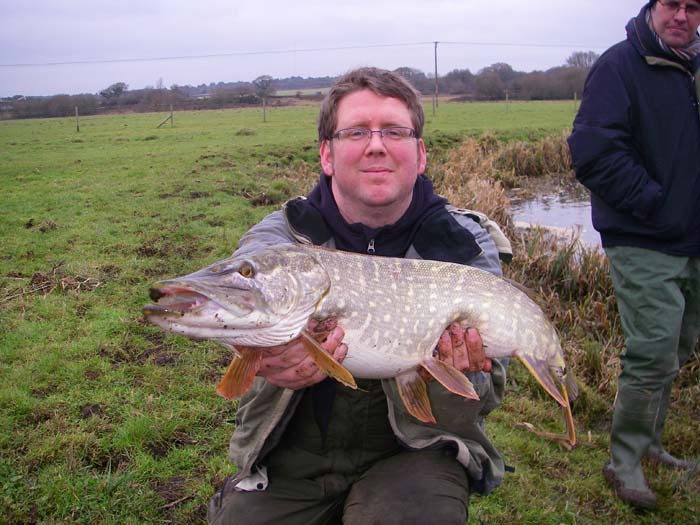 After a bit of a tussle Ben and I managed to land my catch - not a monster but a fine pike in good condition. After showing the fish to Phil and returning it to the water I was about to rebait when there was a swirl and a splash as Phil's bait was taken. Ben stood by to help out while I took a few pictures. Excellent! 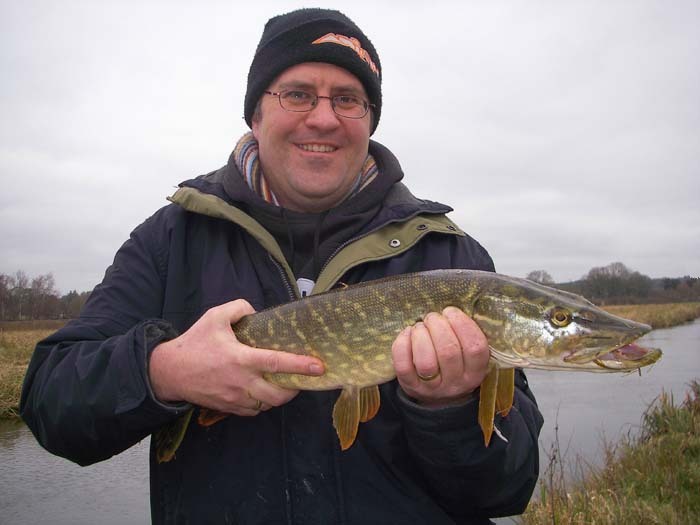 It wasn't long before Phil was grinning as he held up his first ever pike. Two fish in ten minutes - good start. We moved on up to try a couple of new spots and it wasn't long before my paternostered dace was again taken. This one was hooked first time and Phil, being nearest, helped me to land it and took my picture. After the third fish things slowed down a bit. I switched to a spoon to try and conserve bait and we worked our way downstream trying suitable pools on the way. It was some time before Ben managed to induce a bite. 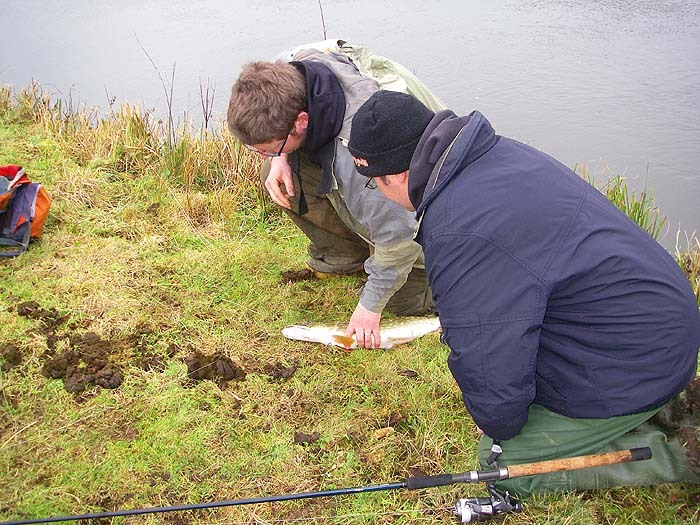 The fish fought well and was in mint condition when it was landed. It turned out to be the first of three for my pal so he made up for his slow start. All in all we had six fish between us for the afternoon including not only the first fish of 2011 but the first pike ever for Phil.